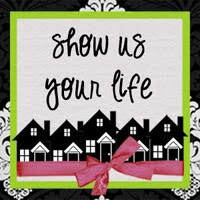 Kelly's Korner is hosting her "Show Us Your Life" today and is featuring one of my favorite rooms in our home. The Kitchen! I am so excited that Kelly is featuring blogger's homes again! There is nothing I enjoy more than checking out home decor. So please take a look around my kitchen and then head on over to Kelly's to check out some other gorgeous kitchens! Our kitchen is my favorite room in our entire house. When we built our home, I already had pictured in my mind what would be my dream kitchen. I had watched countless episodes of HGTV and toured hundred of model homes to know what I really loved in a kitchen. Dark cherry cabinets offset by light colored granite and stainless steel appliances. Our kitchen is just a dream come true for me and I am so grateful that I am able to cook and entertain in such a beautiful place. I love the layout of our kitchen too because it is open to our great room. I am able to prepare meals and wash dishes while being able to keep an eye on Jillian playing in our Great Room. I am also able to watch television, that was one of my pet peeves in our last home, not being able to see the TV from our kitchen. One of my favorite items in my kitchen in our bamboo bar stools. We bought them last Summer from World Market and have been so happy with them. They are surprisingly very comfortable. I will often sit at our kitchen island when I work from home and can sit in those chairs for hours. A recent addition to my kitchen is the window valance. The window was starting to look so naked that it needed a pop of color. I purchased the valance from Target and for now it works for me. I am still debating on whether or not if blends too much with the cabinets. I would like to eventually add a bamboo shade as well but I gave up on that search when I ordered three different bamboo shades while I was on maternity leave and nothing seemed to work out. So the valance it is for now. If anyone has any ideas on what you think would look cute there, I am all ears! I also recently moved this cabinet from our dining room to our kitchen. Right now it is serving as our catch all. I have a basket inside the top shelf where I hide all of our mail, it helps to keep down the clutter from piling up on our counter tops. We are also storing our wine and liquor bottles on the bottom shelf. The cute little lamp on top of the cabinet if from Target. Our kitchen table area is a bit unfinished at the moment. The red curtains are probably the fourth option I have had hanging up there for now and I am still not 100% happy with them either. Again, I just think between the cherry cabinets, the red valance, and the red curtains, there is just a little bit too much red going on. I am thinking of putting the curtains in the great room and moving the chocolate brown panels that are in the great room now back over to the kitchen. I am also in desperate need of an area rug underneath our kitchen table but until I make up my mind about the curtains, I am not able to purchase a rug. Thanks again for stopping by, I hope you enjoyed a glimpse into our kitchen! Karen your kitchen is truly beautiful. I really love your unique barstools and large island. Very nice job! Happy fall weekend to you all! Love your space! Your bar stools are beautiful too!